I'm a little late posting this, but we had so much fun that I wanted to make sure I did! When the weather took a cloudy, cooler turn, we decided it would be a great day to explore the Museum of Coastal Carolina. Just a short walk from the Ocean Isle Inn, where we stayed, plus they have an incredible playground just outside. 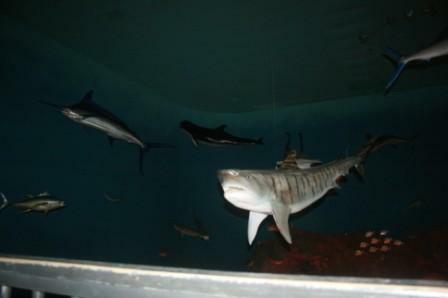 They have many interactive exhibits inside. Admission is $8 for adults, $4 for preschoolers, and the twins were free. 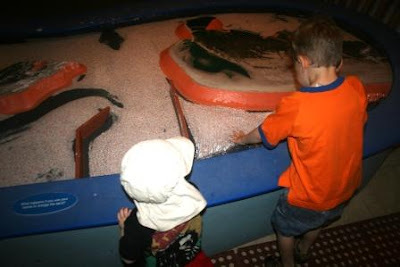 This is a water table, so kids can study how the currents affect the sand. Pierce called this room the underwater room. With wavey lights playing off the walls, it does feel as though you are underwater. And 3 boys who will stand still for 5 seconds. 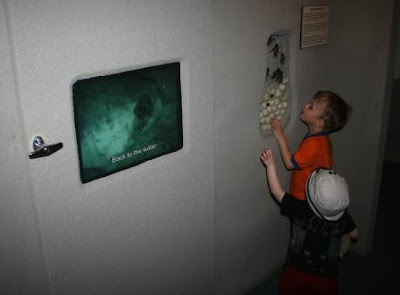 This is a live salt water exhibit. 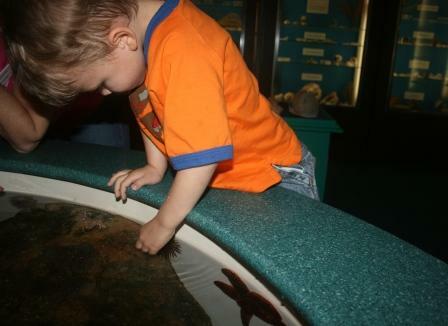 Pierce got to touch hermit crabs, sea urchins, and sea stars. 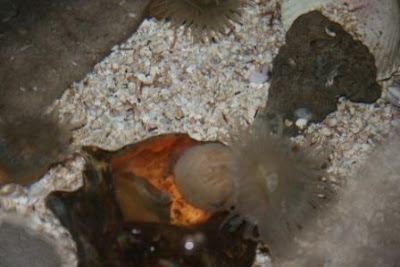 These are sea anemones, and they aren't touchable. After my jellyfish fiasco of 2008 I wasn't going anywhere near these guys! Downstairs is the "Turtle Room". It's full of interactive fun. 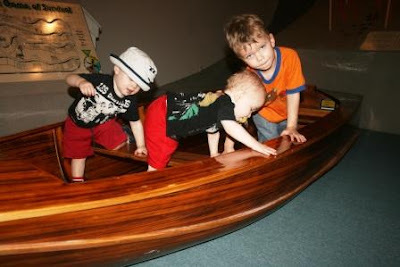 Hmmm, yes, so much for my idea of a nice shot of all 3 boys sitting in the boat. 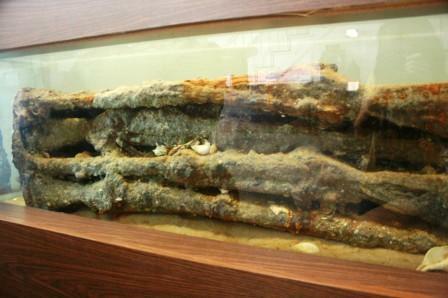 When you exit the museum, they have this display of a case of Civil War rifles. They have to protect them by keeping them in water. 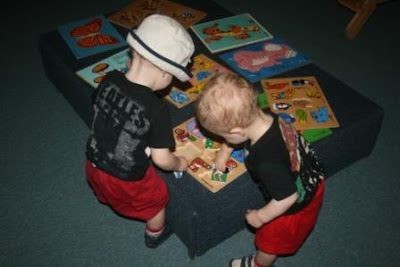 This charming museum is a great place to spend a few hours if you need to get out of the sun, or rain, or just want to experience an educational slant to Ocean Isle. Have you entered my giveaway for a creativity journal and card set yet? It is wonderful that they have so many hands on activities for the boys. What a neat place! The boys look like they really enjoyed their day! When did Reid start leaving hats on his head? What a fun place! 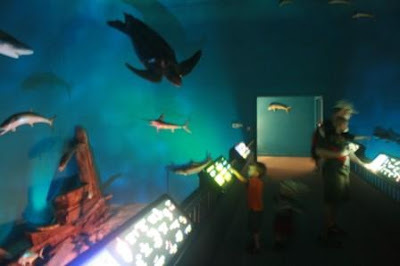 We have Mystic Aquarium here in CT - one of our favorite summer time visits. I, too, have had a jellyfish experience. Meat tenderizer and vinegar, the only thing that gave the sting relief. Ugh. the boat shot is perfect!!! LOL! That's such a great place to take kids! I'm so glad your boys had so much fun! Your boys are so cute. I especially love the boat pic. I remember seeing that when I was there for the conference. I'm glad you had the chance to go. 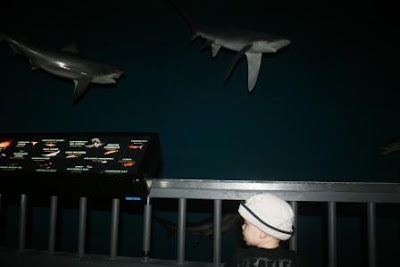 I love aquariums, and obviously kids do too! It's fun for them, but provides something they can take with them after they get home. I enjoyed this vicarious visit through your photos! How interesting about the rifles. I wonder why they have to be kept in water? Wow, Lisa! What a great place. They boys looked like they were having a great time. Bet they slept well that night! I often took my daughter (when she was little) to the Los Angeles Children's Museum where everything is hands-on and educational - even fun for adults...great way to spend the day. Your boys are ABSOLUTELY adorable!!! What fun! We were going to check that out, but the weather cleared up. But how do you protect rifles by keeping them in water, doesn't that rust and corrode them? Strange.I love the boys in the boat!! Who wants a "nice" picture, that's no fun! Candid shots are much better and they look like they are having so much fun!!! Can you believe I grew up on an island but am scared to death of the water! 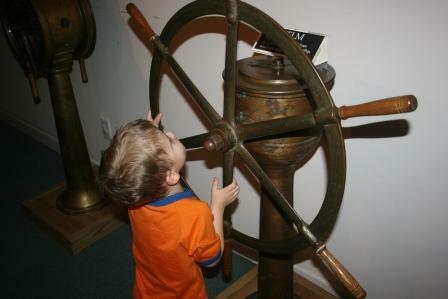 Love the interactive museums, it makes the whole experience so much more fun for the kids! I'm with you on needing a tripod, I would also like a button that I could push & anytime I said CHEESE they would all freeze with a perfect smile on thier face. LOL.